Online learning in the fashion of Khan Academy or the MOOC is an extension of the factory model of education which I believe to be outmoded. One key assumption is that online learning extends a teacher’s reach to more students. My thesis is that students achieve better with individual attention from and dialogue with a teacher. 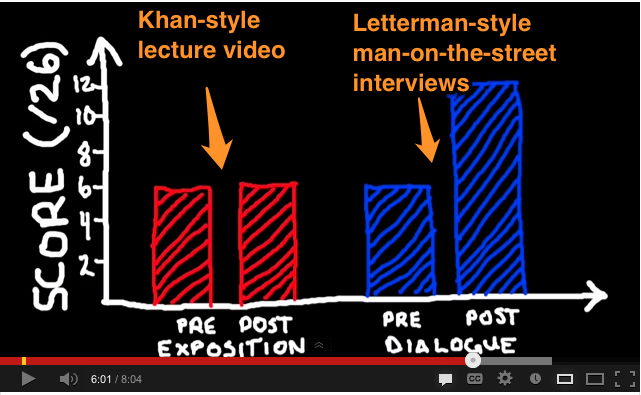 While Khan argues that his videos now eliminate “one-size-fits-all” education, his videos are exactly that. I tried finding Khan Academy videos for my students to use as references for studying, or to use as a tutorial when there’s a substitute teacher, but I haven’t found a good one. They either tackle problems that are too hard (college level) or they don’t use a lot of the multiple representations that are so fundamental to my teaching (kinematic graphs, interaction diagrams, energy pie graphs, momentum bar charts, color-coded circuit diagrams showing pressure and flow, etc.). Online learning in the model of Khan Academy (a video library with accompanying assignments) moves classroom focus from the student to the teacher. It becomes about what I’ve taught, not what the kid has learned/mastered. Teachers are not in the business of delivering content. We’re in the business of helping kids learn. That said, Khan Academy and his competitors, aren’t entirely awful. If you need to reference how to factor a quadratic expression, the video may be helpful. Maybe Khan is most useful when the material is a refresher, not entirely new. In my opinion, Khan Academy-style videos can be excellent tutoring resources but are horrible full-time teachers. When I taught in public schools, my class sizes crept up to 32 students. One colleague taught math to 50 kids in a single classroom. We barely knew or kids’ names, let alone what they understood of our learning objectives. For the same reason, I don’t advocate the MOOC — it fails to address each student’s understandings and misunderstandings of course material. A teacher with a relatively small (<20) class CAN know every student and track their progress toward learning objectives. For example, I know that not all my students have the same misconceptions, therefore not all benefit from the same instruction. Kids are not widgets in a Ford factory. They require individual attention from a teacher who can address their misconceptions. I see promise in some of the flipped classroom pedagogies invented by Jon Bergmann and implemented by Audrey McLaren McGoldrick, Kyle Webb, Graham Johnson, and Ryan Banow. You can see that group share a presentation at Global Math Department in December 2011. One key piece I took from them: flipped classrooms are about YOU the teacher connecting with YOUR students. Not Sal Khan or an MIT professor. Last semester, I played with video a lot as a tutorial tool. While not a flipped classroom, the videos were effective at letting me respond to student questions asynchronously. Case in point: my videos from December are based on a final exam study guide and ALL were solved based on prompts from students. It would be fair to characterize my entire argument as one of local control. I form relationships with my students that I don’t believe can be duplicated to a large scale. Those relationships help me understand how to best teach each one of my students instead of talking at them in a traditional lecture. My very favorite explanation comes from Derek Muller at https://www.youtube.com/watch?v=eVtCO84MDj8. Check out his graph, below. On the left are the results of a pre- and post-test when the instruction style was a expository video (aka, lecture). On the right are the results of a misconception-attacking style he’s created. In a typical Derek Muller video, he interviews people with a question (which ball will hit the ground first, for example). Their answers are riddled with misconceptions, just like the students. He then goes on to attack every misconception. Until a kid understands why his conception is wrong, he’ll continue to believe it. Muller blows those misconceptions out of the water. His research proves that a simple lecture is NOT the answer. Sadly, online learning today (as represented by Khan- and MOOC-style pedagogies) is anchored in the traditional lecture. Until we find a way to individualize the learning and attack misconceptions, I can’t back online learning as the primary mode a student gets their learnin’. I wrote about the topic a while ago, and I had similar views as you do… at least I think I do. I think for flipped classrooms to be effective, it has to involve the teacher and the student still. There has to still be a connection between them, and it absolutely cannot just be a lecture captured on video. Still playing with the idea of creating a sample video, but I really need to find time for it! Just to chime in about MOOCs, I took one in the fall about using the R statistical programming software. The lectures were lectures, the quizzes were trite, but the problem sets and access to discussion forums made it a learning experience. What can I say, I learned how to use R. So I suppose what did it for me was good problem set design and an organized place to get access to lectures (occasionally helpful) and discussion forums (critically helpful). Hi. There are other options in online learning besides MOOCs. The cost model of an online course can be such that the administration may hold the class with as few as five students. But even in a larger online course, I bet more students get to contribute to the class discussion than in an conventional class, and the students that need to sit and think before they speak can do this online. Online is definitely not for everyone – the student needs to be extremely self-motivated and willing to do the majority of learning without lectures. From the teacher’s view, it is hard to know who is lost and confused. But it does work for some people.